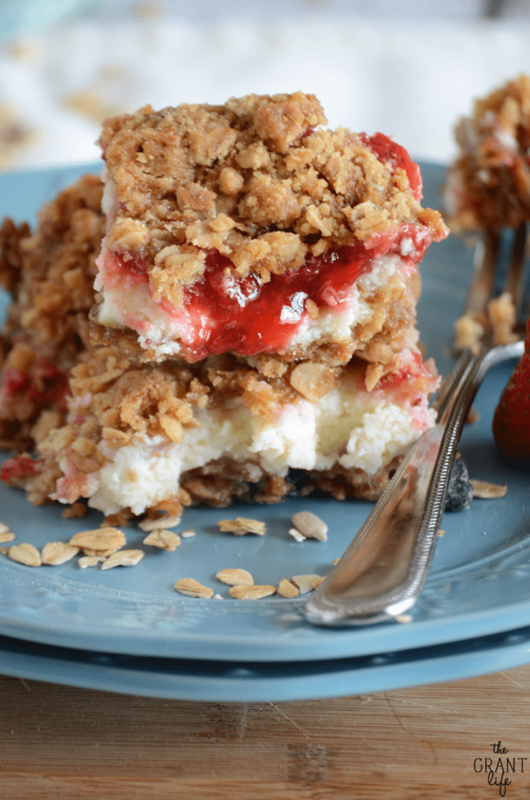 These strawberry cheesecake muesli bars are breakfast or dessert. Or both. My dad had knee surgery about a month ago to fix an old high school football injury. He had been putting it off for the longest time so when he finally set the date I was happy for him and worried at the same time. He is the most stubborn person I have ever met. If he doesn’t want to do something, he’s just not going to do it and you can’t change his mind. And no, I am nothing like that. Mmmkay? My mom called me a few hours after his surgery and said “he’s already out of bed and walking!” Holy cow yall. I was flat out shocked. This is the man who after asking what I wanted for a special dinner after I passed my real estate exam, made the complete opposite. Who refused to drink something before an MRI because it tasted bad. Who is literally the most stubborn person I know. So for him to be out of bed AND walking the same day – whoa. Don’t get me wrong, I was happy! The faster he could get walking the faster he would heal. A few days later he started physical therapy at home and my mom asked me to be there while they worked on his knee. I told the PT guy “Good luck, he’s pretty stubborn.” He just smiled, nodded and headed to the bedroom. Again, he shocked us all. He has been doing great at physical therapy. He went from a walker to a cane in two weeks. He went for evening walks with the kids down the block. He is even now driving to therapy. If you could hear through your computer you would hear my head exploding. I never imagined he would be doing so well in such a short period of time. He is even back to cooking again. He was unsteady the first few weeks, but now he is cooking like before the surgery. This past weekend we went over for dinner and I helped him make fried okra. He made a joke that I wasn’t helping, so I battered the okra and put him in charge of frying it. It was really nice to stand next to him and cook again. Even if he did take a swipe at me with his cane. Whatevs. I told him we would bring dessert since they were doing dinner. 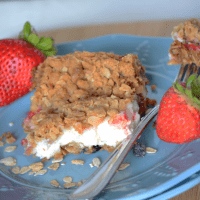 I brought these strawberry cheesecake muesli bars over and they were a huge hit. He took a bit and told me “These are the best thing you have ever made. Ever.” And I’m pretty sure he was being serious. He had one bar before dinner and one after with ice cream. Which was the best idea ever and I copied later that night. He may be stubborn but I like the way he thinks! Ps.. I used Nature Valley original muesli for these bars. They turned out great! Feel free to substitute regular oats or something similar for the crust and topping. Line a 9-inch square pan with foil, letting it overlap on the sides a bit. In a small saucepan, bring the strawberries, lemon juice and sugar to a boil. Let simmer for about 5 minutes or until the strawberries are soft. While the strawberries are cooking, mix together the water and cornstarch. Add it to the strawberry mixture on the stove and cook an additional 1-2 minutes. Remove from heat. The mixture will thickened. Mix the flour, muesli, brown sugar and baking soda in a bowl. Cut in the butter until you form coarse crumbs. Press half onto the bottom on the pan and bake for 10-12 minutes. Beat together the cream cheese, sugar, vanilla and egg. Pour it over the crust. 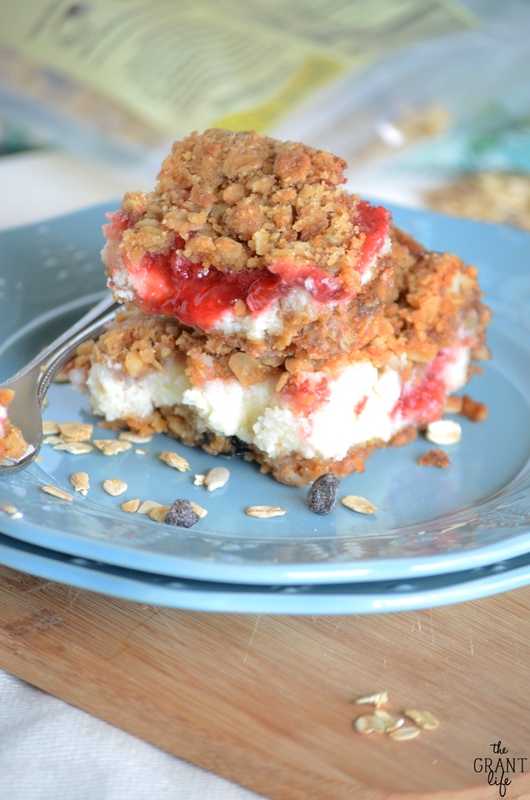 Add the strawberry mixture on top of the cream cheese and then add the rest of the crumb topping. Bake 30-40 minutes or until golden brown and set in the center. So glad to hear your Dad is healing well! These bars look super yummy and if your Dad deems them the best bars EVER. . .I bet they really are! Yum! Oh, hello delicious goodness! 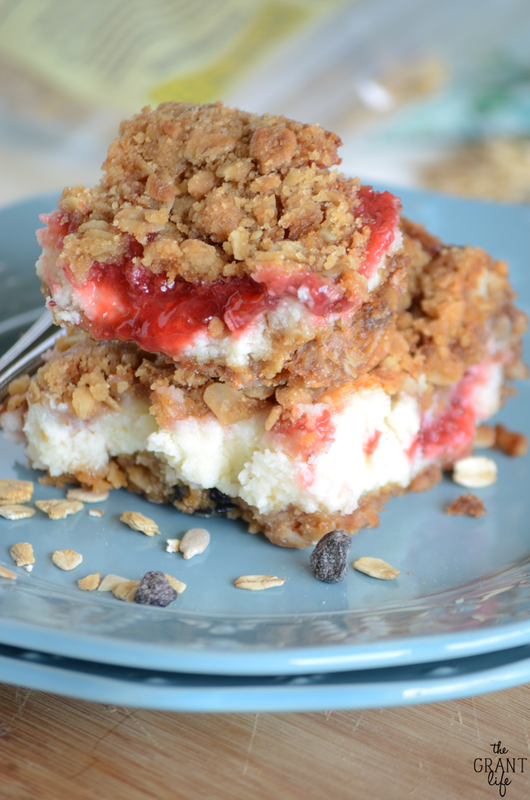 Strawberry cheesecake muesli bars!! WANT! That is great to hear how well your dad is doing! The mind does crazy things when it we are determined! And these bars look like my kinda dessert! 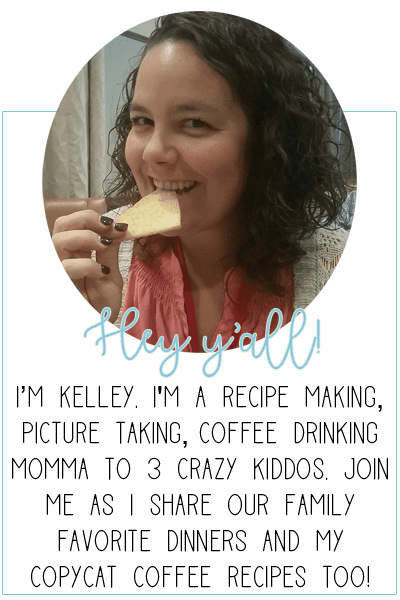 Love that creamy middle with the crunch! I love dessert that I can eat for breakfast! 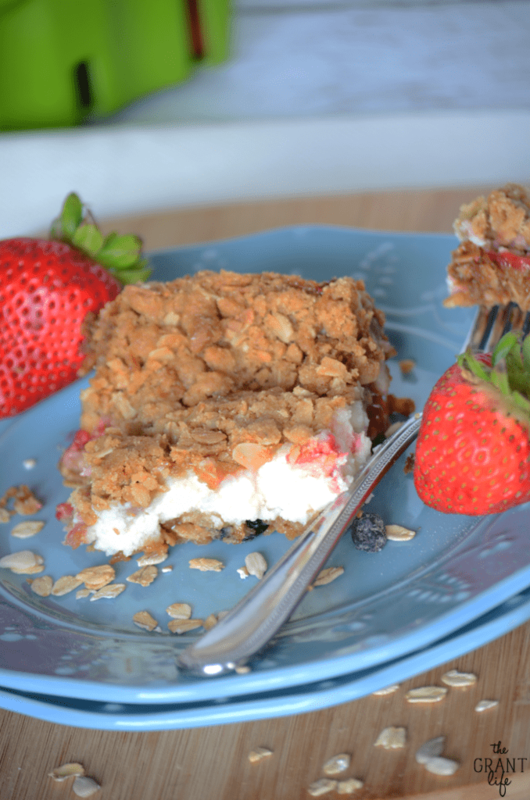 LOVE that cheesecake layer and the crunchy topping! Glad your dad is up and about already! Talk about fast recovery! These bars look delicious!